Local architect Ronald Zürcher's organic design was inspired by repeating patterns found in flora, fauna and pre-Columbian seals discovered on site. Four Seasons Hotels and Resorts, the world’s leading luxury hospitality company, will manage the latest collection of oceanfront villas currently under development on Prieta Bay. It's the first new residential offering at Peninsula Papagayo in over a decade. MIAMI – New ownership led by Gencom, a leading Miami-based international luxury hospitality and residential real estate investment and development firm, today announced that Four Seasons Hotels and Resorts, the world’s leading luxury hospitality company, will manage a new collection of wholly-owned private residences currently under development adjacent to Four Seasons Resort Costa Rica at Peninsula Papagayo. A private path will connect the new neighbourhood to Four Seasons, a members-only beach club and two nearby beaches. 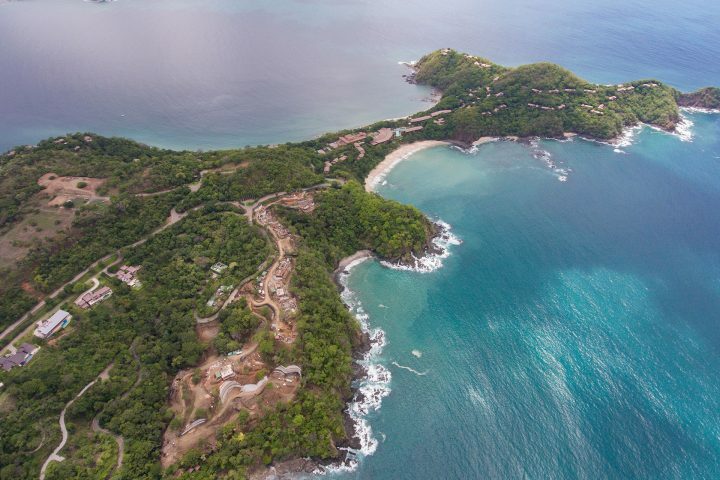 The new enclave, Four Seasons Private Residences Prieta Bay at Peninsula Papagayo, will include just 20 oceanfront luxury villas. Delivered is scheduled for early 2020. A special founders release will be offered for sale in January under a priority reservation program. Prices are expected to start under $4M. Ownership is planning a public release later in 2018. Innovative organic design by renowned Costa Rican architect Ronald Zürcher takes inspiration from repeating patterns found in flora, fauna and pre-Columbian seals discovered on site. Each private residence appears to grow out of the landscape, inviting the outdoors in. Expansive glass walls and thoughtfully designed windows and pocket doors meld interior and exterior spaces, making the most of spectacular views and providing an unparalleled closeness to nature. Casual furnishings and clean lines lend a modern aesthetic. The result is elegant simplicity with an international sensibility that holds its inhabitants in nature’s profound embrace. High-energy efficiency and high-quality indoor environments are integral to Zürcher’s progressive, performance-based design approach — saving energy, water, and other resources. With 99% of Costa Rica’s electricity currently coming from renewable sources, each residence will run on clean energy. Green roofs and local materials are infused into the architecture with a local sensibility. Each Prieta Bay residence comes with membership in the coveted Peninsula Papagayo Club—Costa Rica’s exclusive private club featuring exceptional beach, golf, tennis and social facilities and an array of outdoor programs and activities for members and their families. For more information on Four Seasons Private Residences Prieta Bay at Peninsula Papagayo, visit www.peninsulapapagayo.com, email [email protected], or visit us on Facebook and Instagram. Founded in 1987 by Karim Alibhai, Gencom is a U.S.-based investment firm that owns and operates prized real estate around the world, with an emphasis on luxury hotels, resorts and residential properties. Iconic properties include Four Seasons Resort Costa Rica at Peninsula Papagayo, The Ritz-Carlton Key Biscayne, Miami in Fla., The Ritz-Carlton, Bachelor Gulch in Colorado and Rosewood Tucker’s Point in Bermuda. Headquartered in Miami, Gencom is fully integrated, with expertise in virtually every aspect of development, acquisition, financing, asset management and the sale of hospitality properties. Gencom has had success developing, purchasing and exiting single assets and hotel portfolios, as well as in creating, purchasing and growing hospitality platform investments throughout the United States, Caribbean and Europe. For more information about Gencom, please visit http://www.gencomgrp.com. Founded in 1960, Four Seasons Hotels and Resorts is dedicated to perfecting the travel experience through continual innovation and the highest standards of hospitality. Currently operating 106 hotels and resorts and 38 residential properties in major city centers and resort destinations in 44 countries, and with more than 50 projects under planning or development, Four Seasons consistently ranks among the world’s best hotels and most prestigious brands in reader polls, traveler reviews and industry awards. For more information and reservations, visit fourseasons.com. For the latest news, visit press.fourseasons.com and follow @FourSeasonsPR on Twitter.